This is a conceptually simple and fun piece of work that has been let down by an appalling write-up on phys.org. Reading the paper itself, what the authors have done is to put together two fascinating phenomena from 20th Century physics. At low speeds and with weak gravitational fields, the predictions of Newtonian Physics and General Relativity approach one another, giving rise to dynamics that are so similar that they can be treated as identical. With these two phenomena written next to one another, there is an obvious path to explore. Why don’t we see if we can come up with a chaotic system whose dynamics can distinguish between the tiny differences between the predictions of GR and NP, even at low speeds and in a weak gravitational field? And that’s exactly what the authors: Shiuan-Ni Liang and Boon Leong Lan have done, claiming to have found such a desktop system that can distinguish between the predictions of GR and NP when its dynamics becomes chaotic. Fun! When the predictions are different, general-relativistic mechanics must therefore be used, instead of special-relativistic mechanics (Newtonian mechanics), to correctly study the dynamics of a weak-gravity system (a low-speed weak-gravity system). (1) Usually in the study of chaotic systems, these small differences are differences in initial conditions: that is, you keep the dynamical laws the same but alter the initial conditions slightly. But you could equally ask what happens if you keep the initial conditions the same and slightly alter the dynamics, which is what they are effectively doing here. How is Lockheed Martin’s nuclear reactor theoretically going to work? Let’s start with the basic physics. As most people know, a fusion reaction takes place when atoms are fused together, releasing energy in the form of a fast neutron. 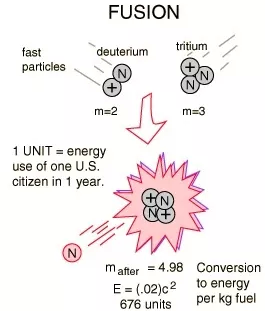 While there are several possible fusion fuel reactions, the best one utilizes deuterium and tritium (isotopes of hydrogen). Of course the problem with initiating these reactions is that deuterium and tritium really don’t want to get near each other due to the Coulomb barrier (one of the fundamental forces of nature). Anyway, in order to compress and heat deuterium and tritium we need to essentially create conditions similar to that of the sun. While we have been able to do this since the 1950s with weapons, that isn’t a controlled environment which can produce electricity. So to make fusion useable, engineers have tried many ideas including blasting fuel pellets with hundreds of simultaneous laser blasts (NIF), using the power of collapsing bubbles and the usage of plasma confinement (ITER, et al), among other things. Plasma confinement is the leading contender for creating a continuous fusion power source. However it has been fraught with difficulties because a plasma at 40 million Kelvin isn’t exactly tame. It “wants” to disperse. Anyway, to explain the design I’ll take the image released from Lockheed but since it is lacking, I’ll describe other elements which are necessary. Vacuum vessel (in majenta)- holds the plasma in a vacuum. Magnetic coils – super-conducting magnets that confine the plasma using magnetic fields. Blanket modules – made of lithium; absorb heat and high-energy neutrons from the fusion reactions. Heat exchanger – required to transfer heat from the blanket modules to a coolant (likely water). The fusion reactor will heat a stream of deuterium (and perhaps tritium) fuel to form high-temperature plasma. This heating is done with radio-frequency heating much like a microwave oven, and the gas breaks down into a plasma. That gas is injected into the fusion chamber. 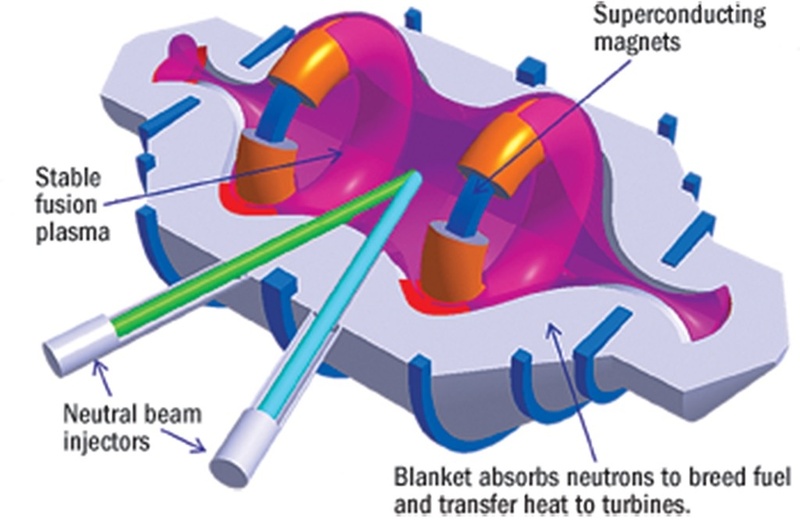 As it is injected, superconducting magnets will confine and squeeze the plasma so that fusion can take place thereby forcing the ions into close proximity. Once fusion reactions take place, a great deal of neutrons will be produced and will fly out, hitting the lithium blankets outside the plasma reaction chamber. Being non-charged, neutrons sort of collide with the surrounding nuclei like mini bowling balls, transferring energy. The lithium blanket becomes extremely hot and can thus be used to generate electricity like any other heat source. A heat exchanger using a water cooling loop will circulate, remove energy and create steam. The steam will drive electrical turbines to produce electricity. The steam will be condensed back into water to absorb more heat from the reactor in the heat exchanger. Note: the breakthrough which is claimed by Lockheed is that they have a way to establish a plasma that is inherently stable. They claim it doesn’t leak in the way that previous tokamak designs do. Establishing a stable plasma has been a major engineering problem for a couple of decades now so if it truly has been surmounted it is exciting news indeed.